Dhaka, Aug 16 (Just News): A Dhaka court today placed Quota reform leader Lutfur Nahar Luma on a three-day remand in a case filed against her for allegedly spreading rumours on social media and instigating violence during the recent student movement for safe roads. Metropolitan Magistrate Kazi Kamrul Islam passed the order after Inspector Md Rafikul Islam of Cyber Crime Unit of Dhaka Metropolitan Police (DMP) produced her before the court with a five-day remand prayer. However, the court ordered the Investigation Officer (IO) to interrogate Luma in presence of women police. The court also denied a petition filed by the defence seeking bail for Luma in the case. Luma was picked up from Sirajganj in a pre-dawn raid yesterday. She was arrested in an ICT Act case filed with Ramna Police Station. 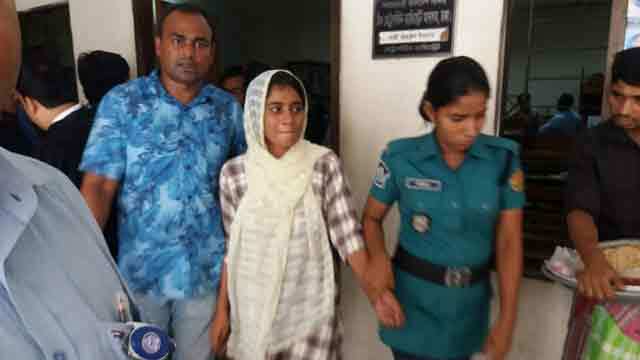 Her arrest does not have any connection with the quota reform movement but rather she was arrested for her involvement in instigating violence during the student protest, said Md Najmul Islam, additional deputy commissioner of the cyber-crime monitoring team of DMP. Until now, 51 cases have been filed in capital Dhaka and 97 people arrested in a massive crackdown since the student protests in Dhaka demanding safe roads. Protests flared across Bangladesh on July 29 after two college students were killed and several others injured as a bus ran over them while competing with another bus on Dhaka’s Airport Road. Since then, Bangladesh government has been engaged in a countrywide crackdown; tracking down individuals who they said helped propagate rumours and instigate the student protests.